to left across the frame. would dream of changing it. with a new gold cap. next door is now Our Town. Flat tire. Please to walk out. wrestles a tire to the axle. about her shoulders to nap. Am misunderstood by whomever I meet…. in the Savior’s Tower to synchronize the chimes. matter where I’m altogether lonely. mushrooms, for rowanberry jam. For regrets. what I call home is neither here nor there. the too-regular breath, the broken spell. spits fthip-fthip-fthip to keep evil at bay. drone of a fly on the face of dank earth. shape and shade of a sable’s tail. not one single strand could show. was weak: he died before our wedding. studding the halos of saints with pearls. I work their flesh in peach-tongued silk. my fur glows richer than the sable’s. I am flying with the falcon. I am snowing perfect pearls. Credit: Young, Katherine. 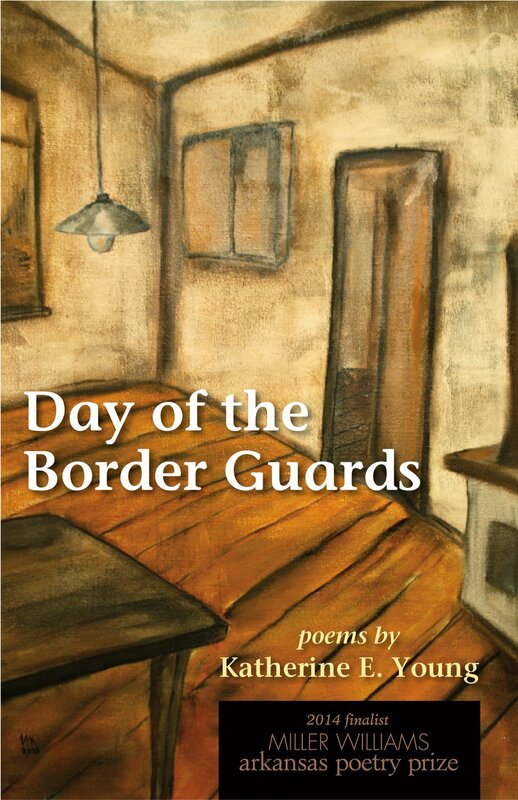 Day of the Border Guards. Copyright 2014 by the University of Arkansas Press. 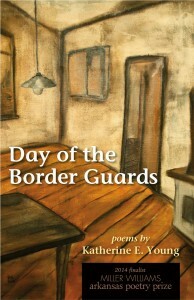 Reproduced with the permission of the University of Arkansas Press. The University of Arkansas Press was founded in 1980 as the book publishing division of the University of Arkansas. A member of the Association of American University Presses, it has as its central and continuing mission the publication of books that serve both the broader academic community and Arkansas and the region. For almost a quarter of a century, the annual Miller Williams Poetry Series has published some of the country’s best new poetry.